Yes, I think that is the future of online microlending. As Zidisha has proven that the concept is viable, I’m sure that we will inspire many similar initiatives. I expect to see other organizations – both new start-ups and established platforms – experiment with direct P2P lending across the international wealth divide. This will be a welcome development, generating positive social impact beyond the reach of our organization, valuable learning opportunities for P2P lending and microfinance practitioners, and useful variety for our clients. What goals does Zidisha have for 2012? 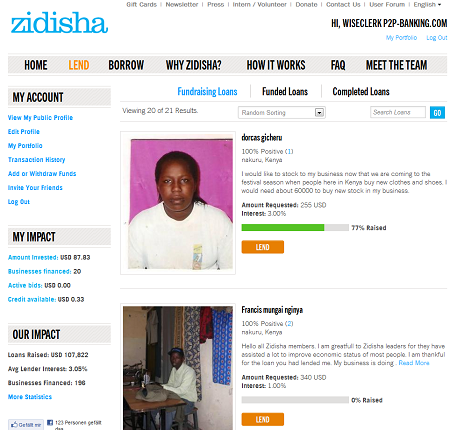 Zidisha’s long-term objective is to become a universally available lending platform, whereby highly motivated entrepreneurs, regardless of geographic location, can access the capital they need to grow their businesses and improve their standards of living, limited only by their own performance and track record of responsible credit repayment. Zidisha’s goal for 2012 is to continue to grow its lending volume, while maintaining quality loans that have a high social impact, high repayment rate, and good communication with lenders.